Five days to go until Halloween, and what better way to countdown to the spookiest night of the year than with a couple of go-to films? Perhaps you'll already know that I'm not really one for horror movies, especially the type that seems to come back every once in a while, exactly the same but with a different (roman) numeral behind the title, do you know what I mean? 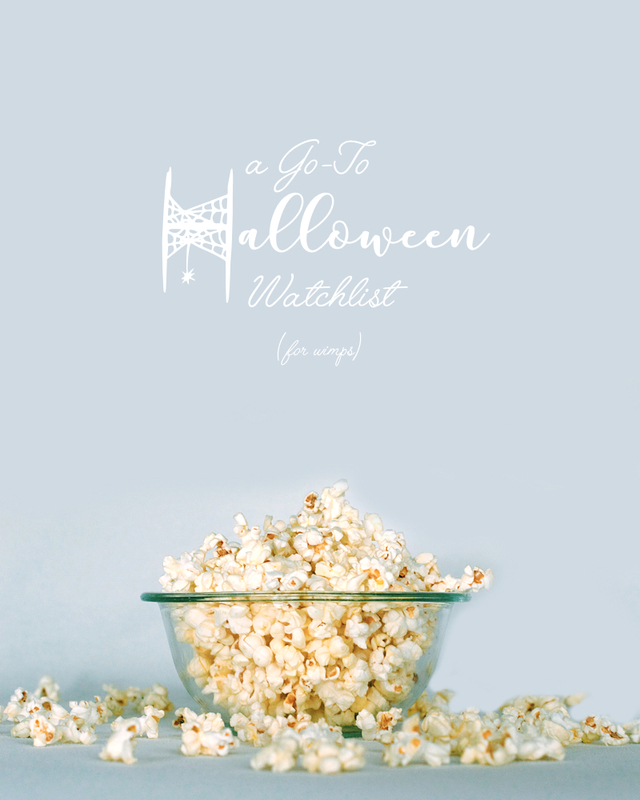 And although I would definitely recommend the classics, I'm just more of a wimp when it comes to selecting Halloween films for my annual 'scary' movie nights. Without further ado, these are the ones I reach for every year. Feel free to download the list and add your own favourites, for those few film nights left OR for next year! We've got a night of spooky films planned today and I'm definitely voting for Hocus Pocus. I'd forgotten about this film for quite some time, but it's been an absolute favourite the last couple of years. It's so nostalgic and those Sanderson Sisters are just brilliant, don't you think? Great idea for costumes, as well, all you need is two of your besties and you're all set to become a party hit! Q: What's your favourite Halloween classic? PS: Are you still looking for the perfect, fun snack for your own movie nights? I'm absolutely loving these little popcorn ghosts and can't wait to try out the recipe!